Vacation rental cabin / bungalow. Sleeps 7, 3 bedrooms, 2.75 bathrooms. No pets allowed. This recently updated cabin blends rustic charm with a modern flare! The cabin is a spacious 1546 square feet, comfortable and light and bright, (lots of new windows and doors)! The kitchen, dining area and three bedrooms and three baths are located on the first floor and the living area is upstairs. Adults and kids alike will love the location. It's just a short walk to Robert's Pub for a quick lunch, dinner, or evening cocktail. An outdoor sports complex is close to the Pub, with basketball, archery, soccer, tennis courts and disc golf. Walk or ride past the condos and the wonderful newly developed Lodge facilities are close at hand. The recreation building and playground will keep the kids entertained for hours. As an extra bonus, the ride over is flat terrain! Walk into the galley kitchen from the beautiful entrance to this home through an Aspen grove. The home has all the amenities of home, plus amazing use of pipe and recycled wood shelves for a modern/rustic feature. The large dining room is light and bright and open to the kitchen, with a brand new dining table to use as a wonderful gathering place for family and friends. There is also a dining area out the slider to the two spacious back decks. Follow the stairs to the living area off the dining room. There is a large new couch, a stunning rock, wood burning fireplace, again with a recycled wood mantle, a large flat screen tv and game table. This is a wonderful room for the family to cozy up to the fire while watching your favorite movie or sporting event. Head back downstairs off the hallway are three bedrooms and three bathrooms, a rarity for vacation homes. A king, queen and bunks with twin trundle each have access to their own bathroom. 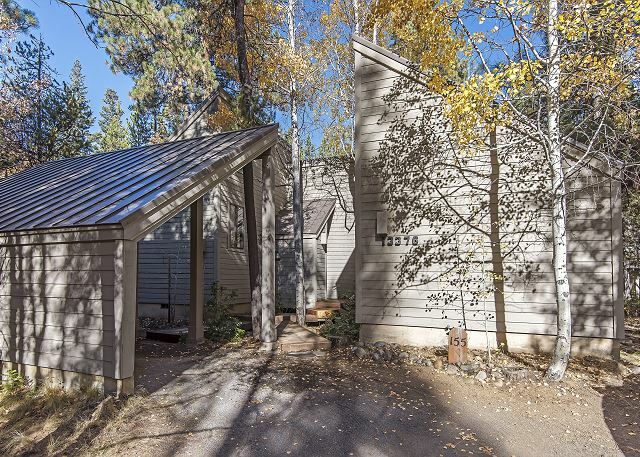 This feature allows lots of privacy and less stress to get out the door in the morning for that golf game, horseback ride or the multiple other recreation opportunities available at Black Butte Ranch. This home also features air conditioning, is in a great location for both your activities and the kids, and is as awesome a cabin as you will find at BBR. You and your family will want to return year after year to your Ranch home away from home. The property was very nice - well appointed, clean and in good condition. Howells Realty Group office staff is less than impressive, however. After paying for the reservation I left several messages with them and each one went unanswered.